About two weeks ago, I ordered ‘The Watch’ written by Gene Stone. There is an interview with the author on TimeZone¬and that triggered me to order my own copy at Amazon.com. I was a bit sceptical towards this book, because I have quite some books about the subject, but they are either too much entry level or too high-tech…¬ Anyway, I received the book last week and I was more than impressed. 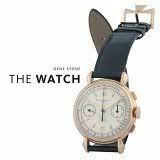 This book covers a lot of brands, history of brands, watch collecting, a watch dictionary, interviews with watch collectors, tips on collecting and buying watch and last but certainly not least… superb photographs. This book would be a nice present to ask/give for christmas! If I would have known the book was this nice, I would have put it on top of my wish list. I am impressed!! !